The Lexus IS 350 is a four-door, five passenger sport sedan. The Lexus IS first made its mark on the North American market in 2001, when it was introduced as the first small, sporty sedan to be offered by the company. More known for their large, luxurious sedans, the IS was a breath of fresh air into the Lexus lineup, opening up the brand to an infusion of younger buyers who were attracted by the vehicle’s handsome, sporty styling and good performance. The IS was refreshed in 2006, receiving a more modern platform and a new range of engines. The Lexus IS is offered in two different trims. The entry-level IS 250 comes with a 2.5 liter V6 engine that puts out 204 horsepower and 185 lb-ft of torque. Power is sent to either the rear or all four wheels through a 6-speed sequential automatic, with the option of a 6-speed manual transmission. Variable-valve timing and four camshafts help the IS 250 turn in 21 miles per gallon in stop and go driving, and 29 on the highway – excellent figures for a luxury car. For drivers who are interested in more excitement behind the wheel, the IS 350 turns up the heat with a 306 horsepower, 3.5 liter V6. This engine, which also provides 277 lb-ft of torque, can accelerate the IS 350 to 60 miles per hour in 5.6 seconds, and tops out at an electronically limited 143 miles per hour. Fuel economy is considerably lower than the IS 250, as the larger V6 turns in 18 miles per gallon in the city and 25 out on the open road. The IS 350 also provides a few other performance goodies, such as the Lexus Vehicle Dynamics Integrated Management System, which watches over traction and stability control and combines them with the anti-lock braking system in order to provide an excellent level of safety and keep the IS pointed in the right direction. A 6-speed automatic is the only available transmission. The IS is clearly positioned as the fun Lexus. This is emphasized by features such as the push button start and the stiffer suspension which is designed to be driven harder than other offerings in the company’s lineup. Of course, Lexus also provides a full range of luxury features as well, such as heated and ventilated leather seats, dual climate controls and an optional navigation system. Lexus has done their best to bring the interior of the IS up to the standard of their other luxury sedans, and the effect is noticeable. There is a decent amount of interior room inside this compact sedan, although the rear seats are better suited to two adults and not three. 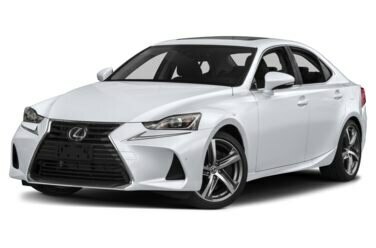 The Lexus IS rewards aggressive driving, and while it may lag behind the German sedans it strives to emulate in a few dynamic areas, it does equal their build quality and exterior beauty. The IS is far more visually interesting than some of the Lexus sedans that have come before it, and it makes a compelling choice in the field of entry level sport luxury cars. The 2009 Lexus IS has had several small changes made to it since the 2008 model year. The IS 350 has had a few changes made to the exterior and interior styling. It has also received an upgraded stability control system and suspension tuning that has been revised. There is also a new two-tone option for the interior colors available in 2009. The IS 250 and the IS 350 both have been updated with new styling and revised steering. The suspension tuning has also been revised in these models to give them a more high-performance drive. The IS-F models have a new interior style with a combination of black and tan. All IS models sport new fascia styling on the front and in the rear. The grille has a new design as do the taillights. The 17-inch wheels and the 18-inch wheels have both been redesigned. On the exterior, the IS now has two new paint colors- Truffle Mica and Amber Pearl. Inside the Lexus IS, the center instrument panel cluster has been changed to a new design. The air registers in the IS have also been redesigned. The switch that works the moonroof is different than on previous models. The outside mirror control is now illuminated. The auxiliary jack that is located inside the vehicle’s console box as well as the DC outlet have both been changed. There is also new contrasting stitching that changes the appearance of the leather upholstery that covers the seats and the door panels. The color of the carpet has been changed to match the instrument panel color. New interior color pairings include leather upholstery in Ecru that is put together with wood trim in golden brown. The upholstery in light gray is paired with maple in dark gray. The black upholstery is also matched to dark gray maple trim.